Another season looks like it will end without the playoffs, and if the Islanders already give you headaches, these last five games must make you sicker. They all have a common theme to them, and I guess that can be a theme that applies to the Islanders season as a whole. Let's take a look at all the breaks the Isles got, only to suddenly let it all fly away. 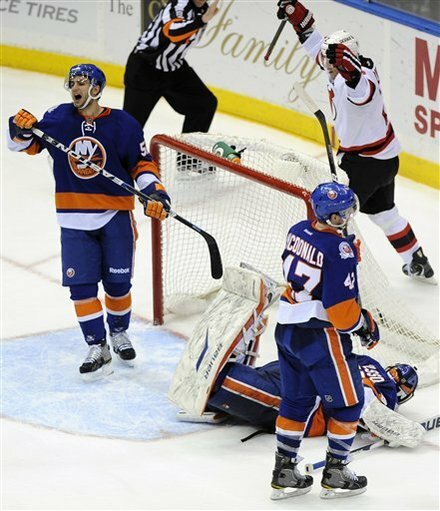 The third of three games that the Isles played against the devils in a span of one week. Anders Nilsson won his first NHL game during the first of the three games, so he got the nod again in the finaile. Through two periods, both Nilsson and Devils goalie Johan Hedberg stopped everything they faced. In the third period, the Islanders got one to the twine when John Tavares got a perfect pass from PA Parenteau, and nailed a perfect shot over Hedberg's shoulder. With less than two minutes left, the Devils caught a break as a weak wrap-around found its way through Nilsson to tie it. Then, seconds after the center ice faceoff, PA Parenteau took a boarding penalty. Newly acquired Devil Marek Zidlicky sealed the Islanders fate off the faceoff in the Isles zone by blasting a shot past Nilsson. With 1:40 to go in the game, the Islanders were winning. With 1:25 to go, they were down 2-1. Final Score: 2-1 Devils. After the Devils disaster, the Islanders had to quickly rebound at MSG the next day. The final game against Rangers is one that the Islanders had to win, unless they would lose the season series vs the Rangers. The Islanders got the first goal, once again by John Tavares, but this time it was in the first period. This is the first lucky bounce the Islanders got during this game. The puck didn't even hit Tavares' stick, it just hit his body and went past Henrik Lundqvist. The Isles then got another break after a Mark Streit slapshot deflected off a Ranger, hit the back glass, and bounced right to Matt Moulson, who banked it off of Lundqvist and in while Henrik was looking the other way. See this crazy bounce HERE. Don't get me wrong, the Islanders were doing a great job keeping things on the perimeter on this play. HOWEVER, there are two things that, in my opinion, could have been done better. Firstly, Nielsen or Streit should have tried to dive at Richards to close up the passing lane and make him shoot. Secondly, the Isles should have realized how much time was left and played like goons. They were down to three men because of an earlier penalty, and with under ten seconds left in OT, anything goes. The Isles could have taken another three penalties, and they still couldn't lose any more man power. They should have been interfering, slashing, and doing anything to prevent a shot. Time for the next one. The title of this entry mostly reflects on this game more than any of the others. Here's the lucky bounce. This goal has to be the craziest goal I've ever seen. This gave the Islanders a 1-0 lead. Then later in the period while on the power play, Travis Harmonic shot the puck towards the net and had it bank off of a Capital defender and into the net. After the first period, it was 2-0 Islanders. They made it 3-0 when JT banked in a rebound off a Mark Streit shot on the power play. After that, the Capitals fought their way back. The one man the Islanders should have kept an eye on, Alex Ovechkin, put two pucks past fellow Russian Evgeni Nabokov, including the tying goal. The Isles caught yet another break in the shootout when Dmitry Orlov lost control of the puck before he could even get a shot off. 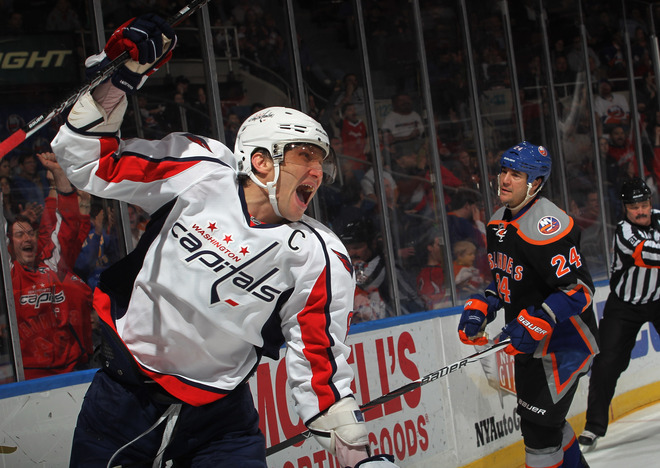 Unfortunately, Mark Streit couldn't convert for the Isles and Matt Hendricks won it for Washington in the next round. The Islanders blew a three goal lead in this one. This had to be tough to overcome. Flyers goalie Ilya Bryzgalov came into this streak trying to break the Flyers all-time shutout mark. The Islanders dug themselves into a 3-0 hole midway through the second period. Evgeni Nabokov wasn't playing like the Nabby he was a month ago. Fellow Russian Ilya Bryzgalov did break the record for the Flyers with just about 250 minutes of shutout hockey. That's more than four games. Of all the ways for the streak to be broken, I wasn't expecting a Michael Grabner fling of the stick. This was another lucky bounce for the Isles. John Tavares scored 30 seconds later to make it 3-2 Flyers. The streak of 35 seconds being significantly less than Bryzgalov's previous streak between goals. Unfortunately for the Isles, they couldn't put a third puck into the net. Flyers 3 Islanders 2. As I am writing this entry, it seems that the Islanders are on a bit of a roll. Wins in Montreal and Toronto have the Isles flying high. They want to try to keep this good momentum going for the rest of the season so they can play the spoiler role for any teams thinking they can roll over them.